Anne Roos is the harpist on the 2015 GRAMMY® Award Winning Album New Age Album, and she most recently received the LUXlife Magazine Global Wedding Awards Wedding Harpist of the Year 2018 for the USA. Her recorded music airs internationally and is described as "beautiful music" by United Airline Inflight Music Service. Anne Roos is considered at the top of her field as a Celtic Harpist. She is a many-faceted performer who excels at playing a wide variety of music styles. Choose the type of music you'd like Anne to play, and she'll deliver with the professionalism that you expect. Anne Roos' performance at the California State Auditor's conference was enjoyed by all! Her professionalism and talent were beyond our expectations. I would highly recommend Anne and her harp to anyone wanting to add an elegant and enjoyable element to any function. Thank you so much, Joe, for your kind review. I enjoyed meeting you and playing for you and your guests. Please consider inviting me to perform for you again next year. Anne Roos' Celtic harp music added that special magic to our daughter's wedding that I could have only hoped and dreamed for. It truly was a thrill to have her and her music shower the event with beautiful and emotionally charged musical pieces. AND she is fun and easy to work with in making a special event the best it can be. Thank you so much, Charles! It was a joy playing at your daughter's beautiful wedding. I hope you'll keep in touch and send photos. My family has known Anne for many years & when I got engaged, my dad insisted we book her for my wedding. Before we even got to talking about music, Anne spent several hours on the phone with me, giving me venues and caterers to check out and other people to ask after. She is a wedding professional and a joy to talk to. She gave me so much advice about having a wedding in the Reno-Tahoe area that I never would've otherwise gotten. Her playlist is beyond expansive. I was so excited that our song was in her repertoire (I Will Follow You Into the Dark) as it's not a traditional wedding song. It sounded so beautiful as she played it behind our ceremony. Being two millennials getting hitched, we also loved her playing of I'll be There for You from Friends for our processional and the Game of Thrones theme song for our recessional. The Got song got a lot of recognition and admiration. It's a moment I won't soon forget. Thank you for the fantastic review, Jill! I LOVED playing for you on your wedding day! I loved meeting your husband and your kind guests, and I loved performing your selections. I'm so glad I helped to make your day special. Please always keep in touch. Anne was absolutely amazing. She is not only a beautifully talented artist, but she was fun, easy to talk to and she helped to make our special day most memorable. Her music is heavenly. We highly recommend her and plan to ask her to be part of our vow renewal in a couple of years. Thank you Anne!! Thank you so much, Melissa! I loved playing for you and James on your special day, and I'm honored that you invited me to play for you. I hope you and James will keep in touch. Can't wait to see photos and videos! Thank you, Kendall, for the fantastic review! I loved playing for you at your beautiful Lake Tahoe beach wedding, and I was tickled to play for your dances. Wishing you many years of happiness! I hope you'll keep in touch. Anne Roos was a great addition to my holiday party. She added a special element and was able to play a variety of music spanning all genres. Her agreed upon performance was scheduled from 5:30 to 8:30 pm. She was such a hit, I asked her if she could extend her performance by another hour. She was able to extend for a nominal rate. She was extremely personable and professional not to mention TALENTED! I would highly recommend her to anyone who is looking for a Harpist. I will definitely ask Anne to perform again at future functions. Thank you so much, Robert! It was a joy performing at your holiday party, and I'm thrilled that you enjoyed my performance. I can't wait to play for you again in the future. Thank you so much, Julia, for this fantastic review! I loved playing for you and Mark, and I hope you'll keep in touch for years to come. Can't wait to see your photos! Anne was hired for our 2016 holiday party and release of our 2013 Cabernet. Exceptional music perfectly played and fit the venue and occasion to a t! Sparkling performance from a truly exceptional artist. I recommend her to anyone wanting to add grace and style to any occasion! Thank you for your glowing review, Bill! It was a pleasure to play for you and your wine club customers, and I look forward to playing at Jodar Winery again. Anne is very easy to work with. She is such a professional. We got to pick the music that she played out of a very long list of possible choices. We had rented a mansion to have our event because it was in November, we asked Anne to set up inside. Since the weather was very nice, many of the people were enjoying the outside patio. We asked Anne to reset her harp outside so that more people could enjoy her music. She made the move very quickly without missing a beat. We would hire her again with no question. Thank you, Renee, for the wonderful review! It was a pleasure playing for you and your guests, and I'm always happy accommodate wherever you'd like me to play, and play your favorites. I hope you'll keep in touch. Anne was wonderful to work with and her music is amazing! She played the ceremony and cocktail hour music for my outdoor wedding. For the rest of the evening, our guests continued to compliment how beautiful the harp music had been. She even took the time to learn a song I wanted for my entrance down the aisle and it was absolutely perfect! I am so grateful to have had Anne play at my wedding! Thank you so much for your kind review, Maddie. It is always a joy playing for the Nevada County Celtic Club and I'm looking forward to playing for you again! Ann played at my wedding. It added such a special touch to the ceremony. Her talent is incredible and our guest really enjoyed her performance. Too soon after our marriage began I lost my husband. I immediately thought of Ann and asked her to play at my husbands service. Again, she gave a lovely performance and it was very special to me to have her there. She is well organized and knows exactly what is needed for a venue. She performed for such important events in my life. I felt that the importance was represented in her performance. What an absolutely beautiful review, Raquel. I hope I can play for you again and continue to offer music for the important times of your life. Sending you all my best. Anne was wonderful and I would absolutely recommend her! We hired Anne to play at my father-in-laws memorial and she was absolutely wonderful! I contacted Anne only a week before the memorial and she was really accommodating to us even with the short time frame. She played all the songs we requested and they were all played beautifully. Anne was a delight to work with and I would absolutely recommend her to anyone looking for a harpist. Thank you for your kind review, Molly! It was a pleasure playing for you and your family, and I'm glad I could be a part of this special remembrance. Anne provided harp music for our outdoor wedding. She played for the ceremony and also played with other musicians for featured music during the wedding. When she plays, we are all transported to some heavenly realm. She creates a magical atmosphere with her harp. She is affordable, flexible and highly talented. We highly recommend her to anyone wanting an enchanting wedding or other event. Thank you so much, Laura for your very kind review! It was a joy playing at your lovely wedding. Thank you so much for the wonderful review! I'm so glad that you enjoyed my performance (especially Metallica!). I hope you'll keep in touch and share photos. Thank you so much, Tara, for the lovely review! It was a joy playing at your beautiful wedding! Congratulations to you and James! Anne is a very skilled harpist and did a wonderful job at my daughter's wedding recently. She is very professional in her appearance and demeanor. She is also very engaged as far as selecting appropriate music for an event. Anne is also a very sweet lady and great to work with. You can't go wrong hiring Anne! Thank you, Gary, for your very kind review! It was a joy performing at your daughter's beautiful wedding. Much More than Great Music! Attired in a middle-class, Renaissance-era dress and sprinkling her harp performances with history lessons related to the Renaissance period – from blind Irish harper Turlough O’Carolan to King Henry VIII and Queen Elizabeth I – Roos delivered a performance that virtually transported our students to a distant time and place. Wow! Thank you, Peyton, for your very kind review. It was a joy to be the featured artist in an assembly at Lake Tahoe School. Please keep me in mind for next year. Set the ambiance for our ceremony!!! Thank you so much, Garrett, for your wonderful review! It was a joy playing at your lovely wedding, and I hope you and Stephani will keep in touch. Congratulations, again! Anne's third performance another success. The Gold Country Celtic Society in Nevada City CA hosted Anne Roos for the third time in as many years on April 22nd. As always, she presented an outstanding program of traditional and modern harp solos. Anne's talent and enthusiasm were greatly appreciated by the attendees of our monthly Gathering. Thank you so much for your glowing review, Dave. I'm looking forward to performing for the Gold Country Celtic Society next year! Thank you so much, Merle, for your very kind comment. It was a pleasure playing for your friend's memorial service, and I'm so glad you and your guests enjoyed my performance. Thank you so much for your very kind review, Richard and Alan. It was a joy playing for your lovely wedding and reception, and I'm looking forward to keeping in touch. Anne played beautifully at my outdoor garden wedding. She added a magical whimsy that I was looking for and she was very professional and even dressed according to our wedding attire. I would absolutely recommend Anne Roos and her gorgeous Celtic harp music. Thank you again, Anne! And thank you, again, Kristen, for inviting me to perform at your beautiful wedding! It was a joy to play for you. Congratulations to you and Mac! Beautiful Music and Harpist - Hire HER! I found Anne while searching on the internet and found through GigSalad. Read the reviews and checked her website that led me to her beautiful sample music/recordings/performances. There was another string artists in GigSalad offering me their violin music service - they don't have any website, no sample music, and instead asking me to email them personally and my info - thought they're Scammers, try to get my money, wedding crash and ruin my wedding. If you want real value for money, very reliable, very professional, with website/sample music and wonderful wonderful music - you hire someone like Anne. She will reply to you right away, you don't have to follow up because she will. She'll send you the agreement, money down and then follow up again for your music selection (l just pick over 50 songs from her list) and if it's not on her list she'll find it for you. She'll make suggestions which music is appropriate for the ceremony/reception. Think about your wedding without any music from a reliable artist? Anne played wonderfully and beautifully and kept our wedding happy - she's a beautiful person too, will dress accordingly to your color motif. Carrying her harp, chair, umbrella (for outdoor) and play over 50 music is no joke, you'll get more from Anne. We had our a very small and intimate wedding, we also had our photographer, videographer, and Anne (and her assistant) sat with us during the reception - they're not there just to do their job but we want them to be included in our wedding/in our family. As an artist myself, l know what they do is hard work. Professional great artist like Anne especially her calm/gentle spirit - you want her to be a part of your wedding too. For me, she is the Best Harpist in Sacramento and The Sierra! Thank you so much, Marichu! It was such a pleasure playing at your beautiful wedding. And to rate me the Best Harpist in Sacramento and The Sierra--What a compliment! Thank you again, and blessings to you and Aurelio. Anne made a special day perfect! The enchanting and beautiful music Anne provided us for the ceremony was breathtaking! She is a credit to her profession. She is wonderful to work with and perfect attention to detail. Thanks Anne! Anne provided the ceremony music for our wedding. She was fantastic to work with, by far the most organized and responsive vendor we worked with in Tahoe. We met her a few months before our wedding and she very patiently played some of our favorite songs and helped us come up with which songs we should use at our ceremony. On our Big Day, the music was just perfect. We really appreciated how reliable and detail-oriented she was, probably the only vendor we didn't ever have to worry about! Thanks Anne! Thank you, Meghan, for your wonderful review! It was a pleasure playing at your wedding. All my best to you and Matthew! Anne provided ceremony and cocktail hour music for our wedding outdoors in the Water Gardens at the Hyatt. She was very professional and helpful throughout the entire process. Anne was able to provide us with recommendations for other vendors. She also gave us a lot of guidance when we were trying to choose the music to play during our ceremony. The day turned out great and we received a lot of compliments about how great Anne sounded during our ceremony. Thank you so much, Jennifer! It was a pleasure playing at your beautiful wedding. I hope you'll keep in touch. Anne did an absolutely beautiful job playing music during our ceremony at Edgewood in Lake Tahoe, NV! All of our guests were in love with the elegance of having a harp player during the ceremony, and greatly enjoyed listening to her amazing talent! The guests were so excited to be able to recognize the music she was playing, such as, her famous, "stairway to heaven" by Led Zepplin, and "Desperado" by The Eagles, along with many others! Just take a look at all of the songs she plays on the harp! She is amazing! I would 100% recommend others that want their ceremony to have that perfect elegant touch, to higher Anne for their ceremony! Thank you again so much Anne for performing at our wedding! It wouldn't have been as perfect and complete without you! Wow! Thank you so much, for the glowing review! It was an absolute pleasure playing for you and your invited guests! Please continue to keep in touch. I hired Anne to perform at my brothers wedding as a surprise. Anne was professioanl throughout the process and willing to learn new music if nessary to accomidate my new sister-in-laws wishes. Everyone at the wedding was impressed with the quality of the music and we all thought it really added a special touch to the day. My brothers wedding was on a beach in Tahoe and Anne was able to accomidate this by bringing a carbonfiber harp down on the beach along with an amp so that everyone could hear the music. I felt like the price was reasonable and she fulfilled her contract completely! Thanks Anne! Thank you so much, Jamie! I loved being the surprise at your brother's wedding. Anne played for a 70th birthday celebration. She is incredibly talented and goes beyond what most musicians would do. She dressed in Celtic attire for the Irish guest of honor. Her musical selection included Celtic music to Broadway show tunes as requested. She was absolutely wonderful to work with and she made the event memorable for everyone. We loved her. Thank you so much, Diana! It was a joy playing for the birthday girl and all of your invited guests. I'm glad everyone enjoyed it. My husband and I wanted a harp player during our wedding ceremony. I googled harp player, took a chance, and called Anne. She was amazing!! All of my guests just loves her music. She was easy to work with, tons of music selections, & affordable! Anne was the perfect touch to our perfect day! Thank you, Lindsay, for your very kind review. It was a pleasure playing for you on your beautiful wedding day. Congratulations to you and Steven! 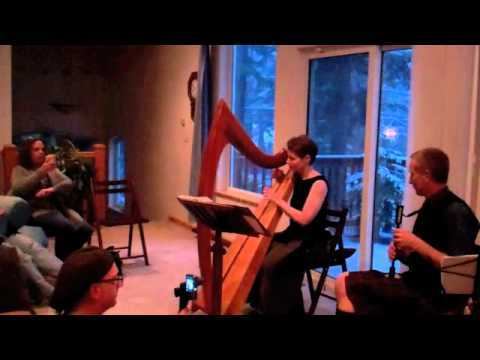 Anne performed for our local Celtic Society, and this was her second performance for us. The music is wonderful but what really makes the event is her interaction with the audience. We get to be 'in the know' of her instrument and her music. It makes the audience engaged and greatly increases the enjoyment. Highly recommend! Thank you so much, Kevin, for your glowing review! It is always a great pleasure performing for you and the members of the Gold Country Celtic Society! Thank you Anne for a beautiful & perfect wedding day! Anne played for us during our wedding ceremony and everyone loved her! We would have her play again in a heartbeat! It truly made our day that much more special. Thanks again Anne!!! Thank you so much, Kristina, for your lovely review. It was a pleasure playing for you and your guests. I'm so glad that I was available to perform for you, even at the last minute. All my best to you and your husband. Anne provided such beautiful music, I couldn't have asked for anything better. Not only that, she was an incredible resource prior to the wedding, suggesting other vendors and even locations as I was in the planning stages. This was particularly helpful as we only recently moved to the area. We're looking forward to attending other events that she will be playing at, such as wine and cheese tasting events, Celtic music sessions, etc. Thank you so much, Kelly! It was a joy playing at your wedding, and I look forward to seeing you at my future performances. Elegant and Sophisticated ceremony - we'll never forget it! Anne Roos added so much to our wedding ceremony. As a senior couple, we were confused by what music we should choose to make our church ceremony special. We definitely chose correctly with Anne Roos. She offers so many choices, and helped us by previewing several pieces with us weeks in advance. We were to have several people of German descent as wedding guests, and Anne played such beautiful pieces prior to the ceremony, they were in awe. From Strauss wattzes to modern pieces, it all came together so beautifully. It made our wedding very memorable, and we give her 10 stars for her overall presentation. My husband and I were married in our home and when our son Paul and his fiancé Jess requested to be married in the family home I was touched. They wanted to include a passage I wrote for my own wedding into theirs and in continuing the family tradition; I knew the Celtic harp would be appropriate for their wedding. I had heard Anne play and thought how wonderful it would be to have her perform for Jess and Paul’s wedding. She was booked for the day, but she opened up her schedule to accommodate the wedding. Ann worked with me to coordinate the appropriate music for the ceremony which included Eternity Candle lighting and traditional Celtic Hand Fasting ceremony as well. Ann’s choice of music before, during and after the ceremony was amazing. We highly recommend her and she added greatly to the whole experience for our friends and family in attendance. Well done Anne! Thank you so much for your kind comments! It was an honor to play at Paul and Jess' wedding. I always work to do my very best--I love to seeing everyone happy! A wonderful addition to my Dad's 80th Birthday Celebration. I was more than pleased to have hired Anne Roos to play her harp at my Dad's 80th birthday celebration. My entire family enjoyed the songs she chose to play and my parents can't stop commenting how much they enjoyed it. I would recommend her in an instant and I will definitely hire her again. Anne Roos performed at our wedding ceremony. She did an amazing job. All our family and friends truly thought this was a great idea for a wedding. Prior to the wedding Anne was able to help assist me when I was stuck with the music selection. She answered all my questions and returned all my phonecalls. She was very professional and a delight to have at our wedding. We hired Anne to play at our lakeside ceremony along with a few other msucians. She organized all the music and even coordinated practice sessions with the other musicians. We also had her play more folk/bluegrass style during our cocktail hour and what she put together was incredible and is still being talked about by our guests! We could not have been more pleased with the musical ambience her talent created and we highly recommend using her for any special occasion! From beginning to end she was a pleasure to work with! Insurance: $1,000,000 - Covered by State Farm Insurance. Proof of insurance can be provided. Elegant music played confidently by Anne Roos, a Celtic Harpist with over 30 years of experience performing at a wide assortment of events. Choose the type of music you'd like Anne to play, and she'll deliver with the professionalism that you expect. This Grammy® Award winning harpist always loved music, even from a young age. Her dad took her to concerts at the Hollywood Bowl, where she would lay her head in his lap and listen to the L.A. Philharmonic play while watching planes skirt across the sky. Anne grew to love English and Celtic music as a child and young teen at Southern California Renaissance Fairs, when she relished the opportunities to sing in madrigal groups, eventually joining stage performers. She started playing the Celtic Harp quite by accident. While employed at an incredibly stressful job, Anne serendipitously met harpist Sylvia Woods inside a booth filled with little harps at a Winter Solstice Festival. Intrigued, she began taking private instructions from her as a creative outlet. Then came music theory courses at UCLA and eventually teaching music for the Los Angeles Unified School District. Her collaborations with other performing artists worldwide took Anne to the Grammys® in 2015, as the harpist on the Best New Age Album, "Winds of Samsara". She continues to drop in to record on studio sessions. For thirty years and counting, Anne continues to enjoy playing at all manner of event--as a soloist at resort hotels, convention centers, cruise ships, concert venues, highland games, Celtic and Renaissance fairs, casino clubs, wineries, meditation retreats--you name it. She is an invited performer for several dignitaries, including the Lord Mayor of Dublin, Ireland. Her ability to play a wide variety of music, ranging from traditional Celtic, Early, Renaissance and classical music, to modern popular music from the movies, Broadway, Beatles, and even Metallica, makes her a popular and much sought after musician for a wide variety of events. Anne is not only comfy performing in front of a live audience--She's also happy playing on camera and behind a microphone. 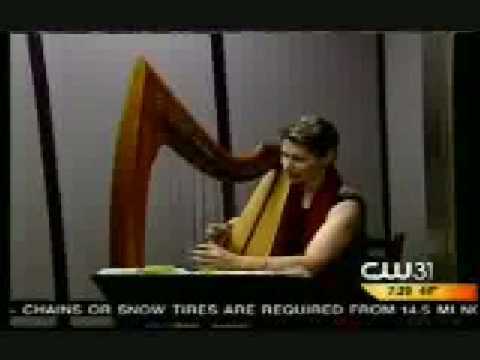 She continues to appear on a number of television programs and radio shows with her Celtic Harp. She used her extensive knowledge of music as a Classical, Jazz, and World music announcer for National Public Radio. Considered a wedding music authority, Anne wrote the handbook, "The Bride's Guide to Musicians: Live Wedding Music Made Easy and Affordable", published by Hal Leonard books. She also published a how-to manual for musicians who are interested in performing for nuptial occasions--"The Musician's Guide to Brides". Anne Roos is an active member of the San Francisco Chapter of the National Academy of Recording Arts and Sciences, better known as the Recording Academy. She served on their Board of Governors, Anne is proud to be involved with this organization, which works to positively impact the lives of musicians, industry members and our society at large. When Anne performs solo, amplification will be provided if needed. To assure that all your guests can comfortably hear her beautiful harp, Anne can use a microphone and small amplifier. The normally acoustic harp is amplified so that the natural sound of the instrument is not altered. Her sound system is battery powered, so an electrical outlet is not necessary. For large audiences and concert performances, Anne can provide her own PA system (electricity will be required). October 07, 2018 • 9:00am - 11:00am Chanting Party! November 05, 2016 • 2:00pm - 3:00pm Live Harp Music for a Wedding Proposal! Anne's repertoire is incredibly diverse. You'll find her complete list of music at her website. A typical set can range from one hour, to several hours (with breaks at each hour). You get to choose the direction of music that Anne performs in her set: Irish/Celtic/Renaissance music, New Age Music, Modern Pop music, Holiday or Religious music, and more! Call Anne, and she'll design a concert that suits your event. Anne can also perform in duets or ensembles. Anne's ensemble set list will vary depending upon the number and type of additional instruments requested (possible instrument availability includes: fiddle, guitar, viola, bodhran, flute/pennywhistle/recorder, bagpipes, vocalists, rock bands, and jazz bands). I am influenced by performers from many different genres, from pop to classical to rock to Celtic music. (And i'm not just influenced by harpists). Harps do not stay in tune in adverse weather conditions--Please provide shade from direct sunlight, heat for chilly weather, and protection from precipitation. Anne and her harp need an area that measures at least 5 feet by 5 feet. 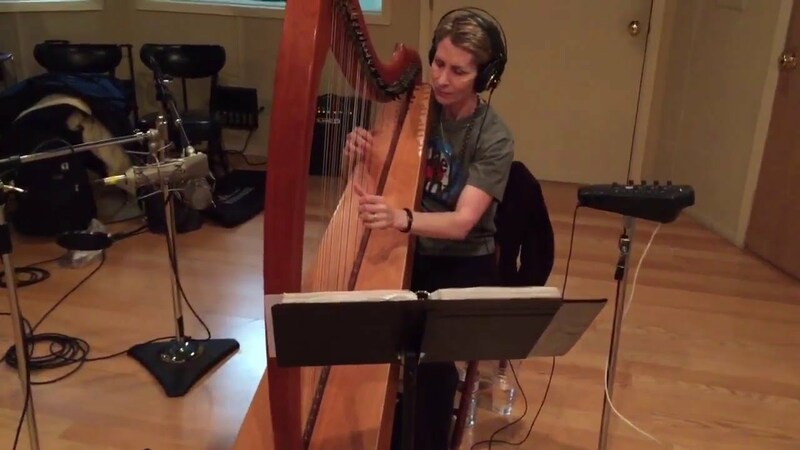 “Anne Roos is an amazing harpist and this CD showcases her talents beautifully. A small musical group joins her on this effort, which highlights songs about woodland creatures such as fairies, nymphs and trolls. A 31 page hardcover book comes with the CD and it talks about various folk history and legends--a nice touch to a well thought out musical effort. The group provides a lovely sound. CDs that are put forth only showcasing harp music can be nice, but it is equally wonderful to have some additional accompaniment; and it expands the amount of people that it will appeal to as well. "Here is a nifty little idea; combine a CD of Celtic harp music, thematically connected by songs about forest and faerie lore, with a CD-sized hardcover book of background information and stories associated with each song. In the hands of a lesser player than Anne Roos, this could have easily been an exercise in prancing around the pixie dust, but Roos’ research, design sensibility, and, most of all, her masterful playing makes this project a delight. Joined by woodwinds, harmonium, percussion, viola, guitars, and fiddle, Roos takes center stage with her sweeping and articulate harp playing on 18 tunes. What brings this CD up a level from just another pretty harp album is Roos’ sharp and clean harp playing. She also has a fine ear for melody and timing. "Lovely" and "enchanting" are two words that come to mind in describing this CD. First, the packaging: in hardcover-booklet form, fronted by marbled paper surrounding a cutout through which shows a tinted illustration from a German fairy-tale book. Extensive notes include an essay on the nature of the "call of the sea," the history of each tune, and a biography of each musician. A perfect piece for gift shops...but how does the music stand up? Quite well, in fact. Anne Roos is an accomplished Celtic harpist, and she is joined by equally accomplished friends to form an ensemble that makes music at the crossroads of Celtic and "ancient music." Anne Roos' Music Heard Round the World! Flying in May or June of 2005? A track from Anne Roos' CD Mermaids & Mariners will be featured on the Rhythms of the World Channel on United Airlines and Air Force One airplanes. This music can be accessed with on board headsets. An official with the company says, "It's beautiful music and absolutely stunning packaging." Mermaids & Mariners is actually a 24-page book containing an instrumental CD, featuring Anne Roos on the Celtic harp, with guitar, fiddle, and viola. This recording celebrates the lure of the sea through ballads, laments, and sea shanties.